iphone app - seach for forum runner in apps store. install forum runner. open forum runner and go to categories. 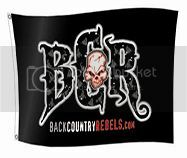 select - recreation>snowmobiles>backcountry rebels site can be added to favorites from there.